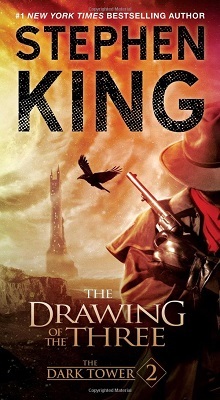 The Drawing of the Three is the second book in Stephen King’s Dark Tower series and, on opening it up, the reader finds Roland sleeping on the same beach they left him on at the end of The Gunslinger. Just seven hours have passed in Roland’s world and when he wakes up he finds a strange lobster-like creature crawling towards him. Unfortunately, the creature can move a lot faster than Roland expects and he is a little slow in getting out of its way. It’s a delay that costs him two fingers from his right hand and most of the big toe of his right foot. All of this happens in the first few pages and leaves the gunslinger with problems that continue right through the book. If you’ve read The Gunslinger you will already know about Roland’s dexterity with a gun. If you haven’t read it I recommend that you do so. Reading anymore of this review is a waste of time. Come back later (about 238 pages later) by then you will know a lot more about Roland and how, through years of training, his hands can work a gun like magic. The loss of two fingers means all the magic has gone from one of the gunslinger’s hands and has been replaced by angry red lines that are working their way up his arm and carrying their poison towards his heart. The fact that he’s lost two fingers is a big deal to Roland. It renders one gun hand useless. Even through his pain and delirium he still remains very much focused on his goal though, and continues on his quest to reach The Dark Tower. He heads north, along the beach, in search of the three: The Prisoner, The Lady of Shadows, and Death. To find the three Roland must first locate three doors, each of which leads to 1980s America. It’s the world of Eddie Dean, Odetta Holmes, and Jack Mort. It’s a time and place that holds a few surprises for the gunslinger, but that’s just “ka”, as Roland would probably say. The Drawing of the Three has a slightly different feel to it than The Gunslinger. Mostly because Roland is in such a bad way throughout the book, but also because the story is no longer just about Roland of Gilead the last gunslinger. It now encompasses three other people and three other lives. Roland also has a few out of body experiences. I can’t really say more than that because I don’t want to give too much of the plot away. Each page does bring Roland a step closer to The Dark Tower though, and I for one am very curious to know what he will find waiting for him when he finally arrives.